The Uni at Borough Hall Plaza in Brooklyn New York in partnership with the Brooklyn Public Library. Sam Davol sat waiting for readers to come into his Storefront Library. It was a sunny Saturday morning in October 2009, and no one was browsing the books in the library he and his wife, Leslie, had started in Chinatown. The prospective readers were two blocks away, enjoying the weather on the Greenway. “I remember saying, ‘Gosh, if only we could move this whole thing outside and go where people were, we could have more patrons,’ ” Sam said. 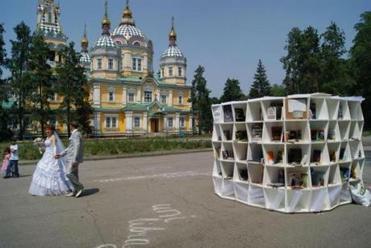 So a couple of years later they did, creating a portable open-air reading room that has seen action in New York, Boston, and Kazakhstan. Sam, 42, and Leslie, 43, describe themselves as committed “urban dwellers” who live alternatively in Boston and New York. (They are in the process of moving to Manhattan.) Sam is a cellist in the indie-pop band the Magnetic Fields, while Leslie has worked in New York museums. “For most cities, public space is something you really rely on . . . because it’s part of your domain as opposed to a private backyard,” Leslie said. In 2009, they started a nonprofit called Street Lab, dedicated to creating art and literacy projects. Besides the Storefront Library, which closed in 2010, the organization has been involved in programs to provide free outdoor screenings of Chinese films in Chinatown and to bring open performing-arts rehearsals to vacant Fort Point Channel storefronts in an attempt to better use space and introduce arts groups to new audiences. 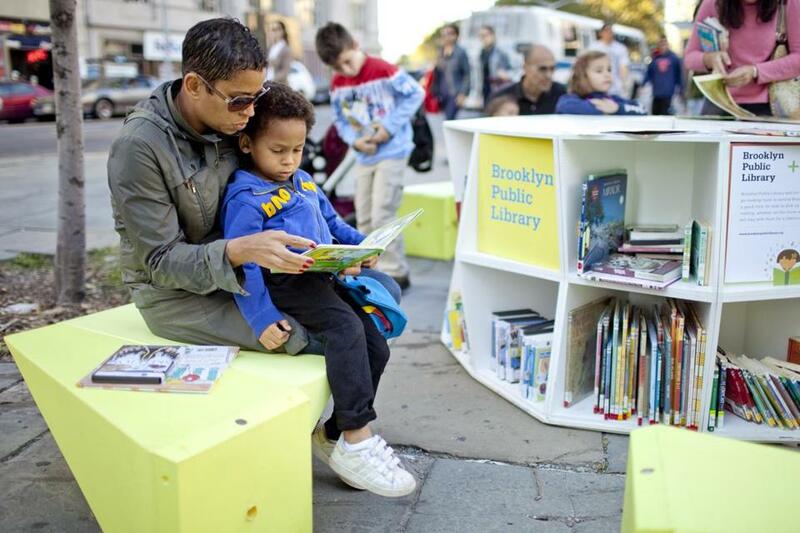 After their library epiphany, the Davols last year commissioned local architects and Massachusetts Institute of Technology students to create a portable outdoor reading room called the Urban Neighborhood Institution. The name didn’t exactly roll off the tongue, so they shortened it to the Uni and financed it with donations from the Kickstarter crowd-funding website. The Uni is composed of stacks of 144 white cubes held together by magnets. Donated books ranging from “Goodnight Moon” to origami instruction manuals to short novels such as “The Catcher in the Rye” fill the shelves for any passerby on the street to look through. Specially designed yellow benches give visitors a place to sit and read during the day; they plug into the cubes to close the Uni at night. The structures are staffed by volunteers and local librarians. “The installation is not to simply provide a service to people in the community, but also to bring these librarians out of libraries,” Sam said. On a recent Friday morning, the Davols loaded a dozen benches and boxes of children’s books, atlases, and dictionaries into a U-Haul parked in their driveway in Cambridge. “We’ll be parked in Brooklyn tonight waiting to go live at 6 a.m. so that when the kids wake up, we’re already there,” Sam said. The Davols decided to base their first Uni in New York, where it has made appearances in several locations, including its debut not far from Ground Zero on Sept. 11 of last year. While the Uni has gotten around a bit, no one expected that one would end up on the other side of the globe in Kazakhstan. That changed when William Middleton, an information resource officer with the US State Department, saw their Kickstarter campaign. The couple sought $20,000 and ended up raising $20,822. Middleton was impressed. “I liked the idea of it so much I wrote a proposal internally inside the State Department to get it overseas,” Middleton said in an interview from Kazakhstan, where he is in charge of the Uni. The State Department came up with $121,000 to build and ship the Uni, buy books, and staff the library. The agency sees the project as an opportunity to help foreign citizens learn English and teach them about American culture. Middleton, 56, of Wrentham, is based in the region and settled on Kazakhstan, because of the country’s pleasant summer weather and high literacy rate (98.4 percent). “There’s a reading culture, which isn’t the case everywhere in the world,” Middleton said. Before it was shipped to Kazakhstan, Street Lab tested the new Uni in June outside the Boston Children’s Museum. Uni made its Kazakhstan, debut in Almaty — the largest city in the country — last month and Middleton plans to move it a half dozen times during the course of the summer. When temperatures drop, it will be put into storage until spring. A team of six people fluent in English run the library, which is open every day from 9 a.m. to 8 p.m. and receives an average of 150 visitors a day. About 500 books in English, Russian, and Khazak fill the cubes and are available for reading but are not allowed to be checked out. Almaty resident Zauresh Amanzholova, in charge of the librarians and scheduling activities, said readers, including parents and baby sitters with children, came every morning when it was stationed in one of the city’s parks. A lot of adults also visit the Uni to practice and learn English, such as one man in his 60s who practiced English with Uni volunteers an hour every day. Amanzholova, 23, heard about the Uni through a State Department exchange program she participated in when she was in high school. Though most Khazakhs can read, Amanzholova wrote in an e-mail that many cannot afford to buy books, and they face other distractions. “People here either spend a lot of time in front of TV and Internet, or they work so hard to earn money that they don’t have time to read books,” Amanzholova wrote. Though the Uni is becoming well-traveled, anyone who had a hand in building it will point out that it was born in Boston. In a second-story brick building in Brighton with an overpowering scent of wood dust, furniture maker Bill Bancroft and his team constructed the cubes for the Uni sent to Khazakhstan. The units were designed by Höweler+Yoon Architecture of Boston and a team of MIT architecture graduate students that included Alexander Marshall and David Costanza, under the guidance of J. Meejin Yoon, an MIT professor and Howeler+Yoon partner. Marshall and Costanza built the first Uni in a woodshop at the university and even created a casting machine for Uni’s benches. “It looked like something out of da Vinci’s sketchbook,” Marshall said. Eric Höweler, principal of Höweler+Yoon and assistant professor at the Harvard Graduate School of Design, said the structure had to be lightweight — each cube is 5 pounds — and easily installed so that even a child could figure it out. No tools are required. “Like LEGOs, there’s an infinite number of ways they can put [the cubes] together,” he said. The Davols say the next step is to figure out how to make the project sustainable and perhaps expand. They’ve already received requests from people in Seattle, Santa Barbara, Calif., and even Germany who would like the Uni to make an appearance in their hometowns. But until the Davols can build more Unis, the American project can only go where they go. “It’s really a matter of where we can drive with the truck on 95,” Leslie said.